Nathan Salem (right) scored twice for Phantoms at Bracknell. Peterborough Phantoms powered to an emphatic victory in a top-of-the-table showdown last night (November 19). The city side stretched their advantage at the NIHL Division One South summit to three points following a 7-2 rout of Bracknell. Darius Pliskauskas played well for Phantoms in Bracknell. Phantoms twice found themselves behind briefly to powerplay goals from Bracknell man Callum Best in the opening period at the Hive. They levelled within a minute on both occasions thanks to Nathan Salem and Ales Padelek before hitting the front for the first time when defenceman Ed Knaggs struck short-handed early in the second session to claim his first Phantoms goal. A Darius Pliskauskas effort towards the end of that period stretched the advantage before Phantoms lit the lamp on three further occasions during a dominant display in the final stanza. Lithuanian international Pliskauskas helped himself to a second goal before Will Weldon got in on the act. Salem then completed the scoring inside the final minute. 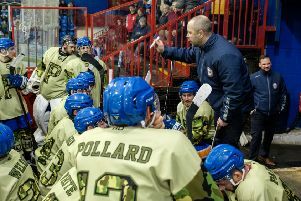 “It definitely goes down as a good weekend,” said coach Slava Koulikov. “We produced a great fightback in the final period and then won on penalties against Basingstoke in the cup on Saturday. “We then responded really well to going behind twice in Bracknell and went on to win the game comfortably. “We put the game in our hands in the second period and we were very clinical in the final period to finish it off. “It was all about getting results this weekend coming off the back of a disappointing spell. “We’re happy at the top of the table. We’ve now beaten Bracknell and Swindon home and away, and they are very important wins. “We all know we have dropped a point or two lately, but we have made up for it with other results. Phantoms were only able to call on four regular defencemen with Ben Russell joining Greg Pick on the injured list and Nathan Long unavailable all weekend. Youngster Callum Medcalf slotted in impressively while forward Leigh Jamieson dropped into a defensive role to good effect. Phantoms are now three points clear of Basingstoke and Bracknell in the standings. Basingstoke boast a perfect 10-game record in the league. Phantoms face two away games this weekend. They go to Sheffield in the NIHL National Cup on Saturday (November 25) before heading to Invicta for a league clash the following night.